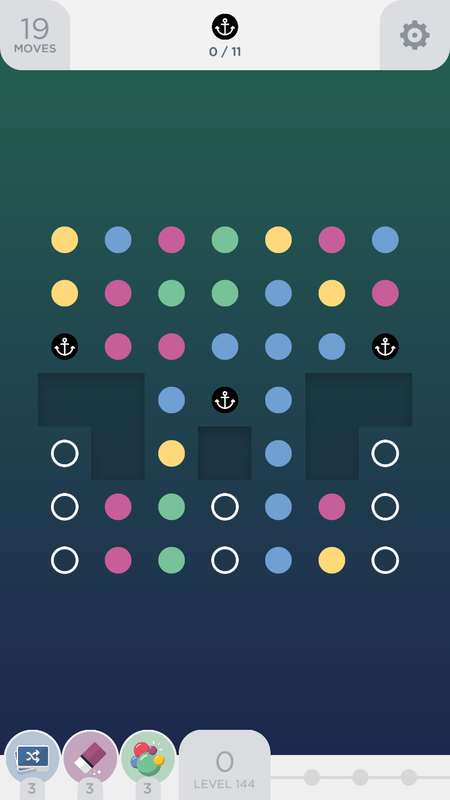 You only have 17 moves to clear the two anchors you see on the board and then clear enough dots to get a two more to appear and clear *them*. If you restart until you get a board where you can start out with two initial squares, you’ll clear this level easily. This board seems to generate completely randomly, so that getting a board with a first move square is not uncommon. You pretty much need a quick route to a square or you might as well exit and come back in to a new board. The best boards have a natural square available for the first move, but a square using a single clear dot isn’t a bad start either. Aside from getting a good initial start, make squares, pick the square that clear the most dots, and conserve clear dots. When you first get into level 139 of TwoDots, you’ll think finishing the level off will be incredibly easy: Clear dots, no special obstacles, and after a few moves, you’ll be making a square every time. Unfortunately, you have to clear so many dots that you have to choose wisely once you get to making squares. Get to your first square as efficiently as possible. Every move counts. Your first squares will probably require any major decisions… it’s better to clear a square than almost anything less than a square. After you make your first square or two, conserve clear dots for when you need them. Favor completing squares that clear the most dots of a color. Favor completing squares that clear dots that you still need to clear if an equal number of dots is cleared by either. Favor completing squares that require the least clear dots if two options clear an equal number of dots that you need otherwise. I also like to save a square of clear dots for near the end when I have almost all of my dot quota met. The high dot quota for this level makes it all about squares. Make a inverted L clearing of three dots in either the lower left (purple) or lower right (blue). The lower left seems to set up better square opportunities for me, but that could just be a personal thing. Clear two dot horizontals to reposition for squares when necessary. You have a small number of moves to get the anchors down. Work on clearing squares to drill down through the middle. Make sure that the square you’re clearing is going to clear a dot touching some part of the flame. Be sure not to clear down to the bottom without having a solid route to continue clearing fire dots, because once you separate the fire, it will grow twice as fast. Once you’ve split the fire, you’ll want to use squares to continue clearing dots that touch both sections of fire if possible. Maintain a relatively clean board, because you’ll need to make a few squares after the first four anchors drop in order to hit your 6 anchor quota. Clear the two dots under the sand blocks in the middle first. Clear some at the top before using the white and green squares at the bottom. Prioritize squares based on how much playing area they will open up. The main challenge here is clearing to the bottom as efficiently as possible. I start with the middle pair of dots and then make matches that will keep digging going. rating if you complete with even a move to spare, but maybe that’s because I’ve only finished it with a flurry of squares. This level is all about making big squares. Remember that any time you complete an enclosed shape larger than a 2×2 square, it counts as a square. If you enclose dots that aren’t part of the outline of the shape, they turn into bombs. I found myself making at least one L-shaped shape (joining 3 3×3 squares) because there was at least one dot for each 3×3 square that was a different color. Make sure to remember that the dots in columns with open spaces fall at twice the rate of the columns with only dots. It helps to restart until you have at least one 3×3 square that you can complete within the first two moves, just because it temporarily reduces the number of colors surrounding the open spaces that you’ll have to match up to make the next square.